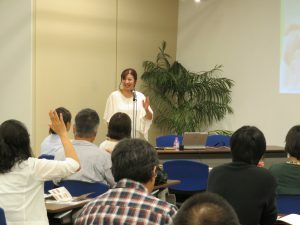 The Tourism and Exchange Division organized a seminar on “A New Approach to International Cooperation – Challenges to Social Business,” inviting a social business entrepreneur, Ms. Yachiyo Nakamura from Manila, the Philippines. Ms. Nakamura started her social business, opening a “uniquease” restaurant in the Philippine, in order to help the youths in poverty to be independent. Those youths receive an opportunity to work at the restaurant, learning the skills and abilities to live in a society. Ms. Nakamura has been engaged in the social business, offering training for the youths who lack family and social supports as well as financial and psychological security. She described her successful and challenging experiences and illustrated her perceptions and suggestions to become an effective social business entrepreneur across the nations. 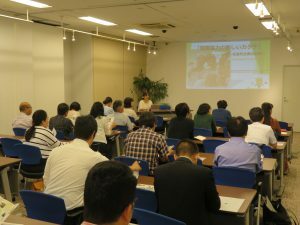 The audiences offered her a variety of questions regarding social business, international cooperation, and sustainable management of a business.